Wine should breathe a little, but not overnight. Putting an end to the oxidation process, which turns a favorite Merlot into vinegar, is easy with the Vacu Vin Concerto Wine Saver. 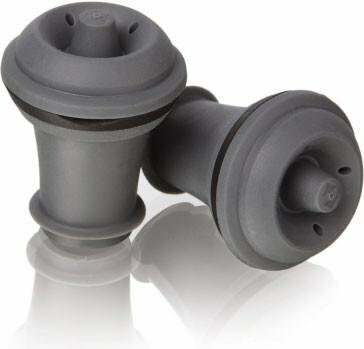 These long-lasting extra stoppers are designed to work with the vacuum-style pump (sold separately) to keep a wine fresh. Made of high-quality rubber, they won't affect the taste of the wine. And the method is simple--just place a stopper in the opening of a bottle, place the pump over the stopper, and pump air out until the pump clicks to indicate that the correct vacuum level has been attained. This process is suitable for preserving all but sparkling wines, and will save Chiantis, Syrahs, and others for up to two weeks. If you have any questions about this product by Vacu Vin, contact us by completing and submitting the form below. If you are looking for a specif part number, please include it with your message.